It’s amazing how quickly smartphones, tablets and laptops have become indispensable. Our fancy tools for communication and procrastination rarely leave our side, and are often the last thing we see before we go to bed. But this nocturnal technology use is keeping many people awake. 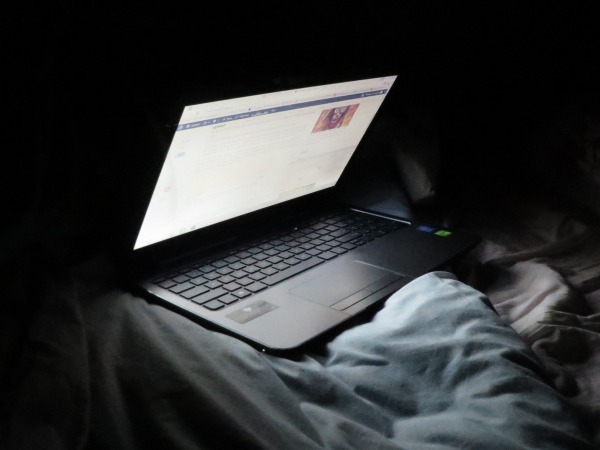 In fact, researchers have found that using any bright screen in the hours before you try to sleep can interrupt your sleeping patterns. The screens of mobile phones, tablets and computers all use blue-coloured backlight. Whilst blue is the best colour to make the screen bright and easy to read during the day, it also suppresses melatonin. Melatonin is a hormone that is important for regulating sleep and wake cycles. It only starts being produced when it is dark, and you can only fall asleep when you have enough melatonin in your body. “Melatonin is released about two hours before we’re meant to fall asleep,” sleep psychologist Dr Damon Ashworth told upstart. The effects of sleep deprivation have been well documented. A lack of sleep can lead to the development of anxiety or mood disorders if it is not addressed. But let’s be honest – it will take a lot of effort and evidence to force people to cut down on their screen usage. Fortunately, there are ways to cut bright and blue light out of your night-time phone use. A number of computer programs and mobile apps have been created to minimise the effect of blue light at night. The most famous, f.lux, changes the colour temperature of your computer display to warmer colours when the sun goes down. It’s based on your local sunrise and sunset times. f.lux is currently only available on laptops and desktops. It is possible to download the program to mobile Apple devices, but only if you are willing to jailbreak your device. Android has its own red light app, Twilight, which runs on the same principle as f.lux. It works out your location and applies a red filter to your phone or tablet at night-time. No research has been done on f.lux or its effectiveness, though its website lists a large number of research papers on blue light and melatonin. Dr Ashworth thinks the basic science behind f.lux is sound. “[These programs] have been shown to cut out the blue light wavelength. Blue and green are the wavelengths that are most activating. They’ll be given to people with seasonal affective disorder or people who tend to get more down during the winter,” he says. While red light programs could be the answer to our sleep-deprived prayers, Dr Ashworth would still recommend keeping the screens away before bedtime, especially if you’re trying to have a stress-free night. “It’s important first to figure out what is driving people to use mobile phones. If it is just about a distraction method then are there other methods they could use to distract them better,” he says. Dr Ashworth also suggests relaxation exercises, listening to music or journaling. He says that the key to breaking away from late-night screen usage is to think about the wider picture and finding alternative entertainment. You might want to sleep on the idea. If you are worried about sleeping problems you can find help at the Melbourne Sleep Disorders Centre or the Epworth Sleep Centre. Erin Leeder is a third-year Bachelor of Journalism student and upstart’s Culture and Lifestyle editor. You can find her on Twitter (though maybe not at night time): @155erin.